2 Days workshop: The Anatomy workshop is usually held over a weekend for two days, normally (if not the organizer keeps different information), Saturday and Sunday at 9:00-16:00 with breaks for lunch and coffee. 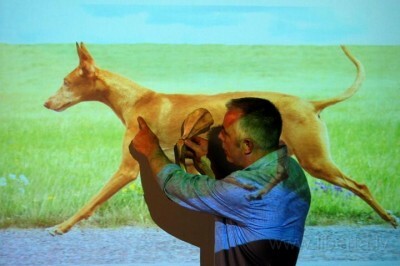 Gerard O’Shea’s anatomy workshop using many visual aids and physical demonstration, teaches the pupil how to understand how and why dogs look and move like they do. Gerard’s unique ability to teach such a heavy subject with a great deal of information, but still maintaining to stimulate, entertain and keep the attention of the class is impressive. The course is normally held over 2 days: Saturday/Sunday daytime. The first day in mainly theory. Why do some dogs stand with a good top line but moves with a bad top line? We learn why some dogs stand with a strong and straight forehand but when in movement, the forehand is loose and unstable. Why a dog that appears to be built very well standing, may disappoint in movement and why sometimes the dog you expect to move well does not. Rather than just pointing out, “this dog moves well or doesn’t move well”, Gerard will show and explain to you why. Many times being able to specify exactly which bone or proportion is creating the “problem”. He teaches his pupils how to analyse a dog as well as how to write it down in a critique form. Last day is theory and practical: All pupils are encouraged to bring a dog with them to this last day of the seminar. We start with theory. Second half of the day: We split up into groups of 5-6 people, where with a carefully regulated system and cooperation we learn to judge and analyse one another’s dogs, and then we are taught how to summarize it into a written critique. Gerard is here rotating through the groups giving support, encouragement and advice. This course is very popular with prospective judges, breeders and all sorts of competitive people.